Well, despite the rough night last night, we have done our best to make today a better day. It still started out iffy. I woke up with a tremendous headache and a backache, too, because Patrick found the button that turns off the auto adjusting mattress. I thought this would be better because it wouldn’t keep sinking on my side every time I moved. However, without that extra inflation, sleeping pressed into the corner of the bed with Patrick on my arm just made my back hurt. But, at 9 I managed to sneak out of the bed with him still asleep and take some pain medicine and have the morning conversations with the doctors and nurses without waking him for a little. I also got on Amazon and used our Prime account to order a few of the supplies that we desperately need for discharge that I just don’t see how I’m going to make it to a store to buy. (If you don’t know this about my faith.. we don’t shop on Sundays. Goes back to the 8th commandment where it says not to make your servants work on the Sabbath.) Sure hospitals are 24/7 and medical emergencies force my hand from time to time, but we try REALLY hard to stick by this principle and not many any more people work for us than necessary on Sundays. So shopping had to be done today or it won’t be done. But back to the story.. The team rounded early. That was nice because it meant I wasn’t stuck here. There were no changes in the plan. Just trying to get the right medication dose. Alas, at 4 p.m. we learned that the morning dose had been low still. That means that tomorrow and Monday’s levels have to both be in the target range because we need back to back good values before he’ll be ready to go. I did get one thing right, though, in my advocating for his care. I asked the nurse to give him his zofran an hour before the time he usually wakes up. And, for the first time in 2 weeks, Patrick got up without being nauseous. That made a HUGE difference for how the day went. Getting him ready was so much easier because he felt good enough to sit up to get dressed and for his bath. I think that’s going to be a daily change for a while. 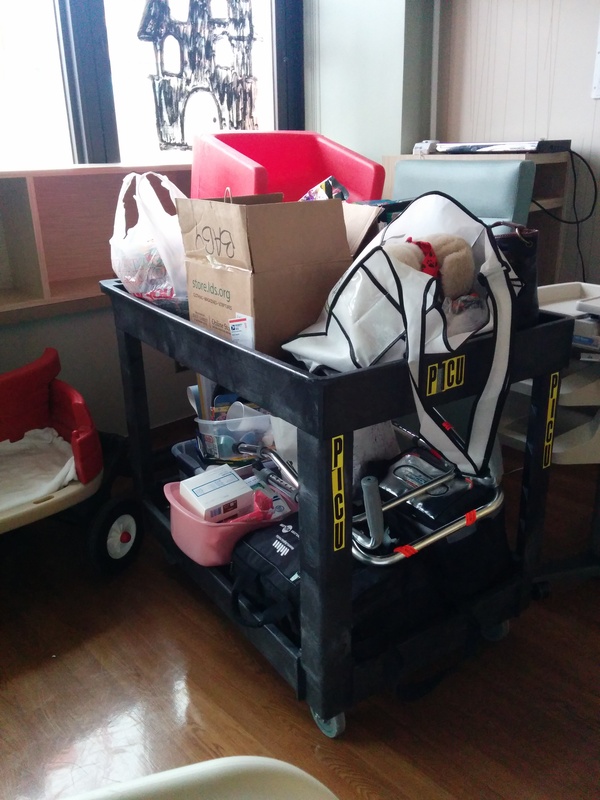 Today’s shipment was an assortment of medical supplies and a set of small plastic food storage containers. The latter made me very happy as it made it much easier to raid the leftovers from last night’s dinner at the Ronald McDonald House and bring them here for lunch. I even managed to get back to the room on time. We are running into some sure signs that Patrick is feeling like himself again. He doesn’t want to sleep away from home. It’s getting hard to get a good blood pressure reading because he won’t hold still. The room is cluttered with bits and pieces of his toys and crafts. I am spending most of my time just watching trying to keep him safe. 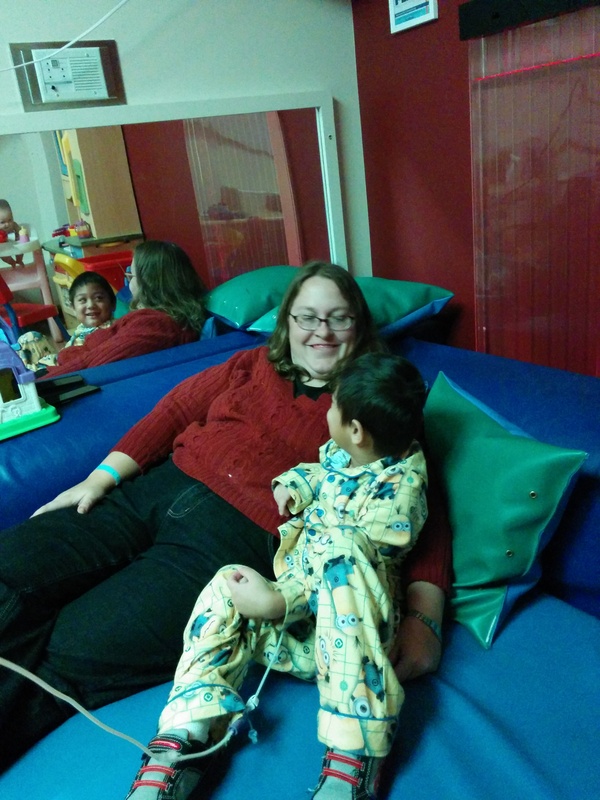 We did make it to play in the playroom a bit this afternoon. We ordered up dinner from room service. Patrick has been excited to try their roasted potatoes and did as good of a job tasting them as he ever does. I am hopeful we’ll make more progress once we get outpatient and I can cook for him. Then, this evening I decided to double our evening walk. Last night as we walked to the cafeteria, we saw that they had put Christmas lights in one of the outdoor gardens. So today we walked down to that garden to see the lights. He only got tired and asked to be carried once. (Goodness is he heavy with these weak muscles!) He didn’t last long outside, but he made it all the way back after just a short break and was even kind of skipping/jumping along the way. I have good intentions to bat my eyes and see if I can’t get a nurse to let me “practice” with his portable feeding pump in a backpack tomorrow and see how far he can go if the pump battery doesn’t die and bring us back.) One nice thing about the hospital being dead on the weekends is that it doesn’t seem as dangerous to go play in the halls. We read some books using the Readeo account his Uncle Mark bought him, and then put him to bed. Like I said, he tried to play and stay awake. This is also typical, feeling-himself Patrick behavior. But his little body needed rest and he was out within 5 minutes of me biting the bullet and saying I couldn’t lay with him because he was trying to play with me. This entry was posted in Life as an SBS mom, Medical updates, Recovery, Transplant and tagged hospital stays, intestinal transplant, physical therapy, sabbath day, special needs parenting, transplant, University of Nebraska Medical Center on December 7, 2014 by geekino. A Christmas tree appeared in the playroom yesterday. 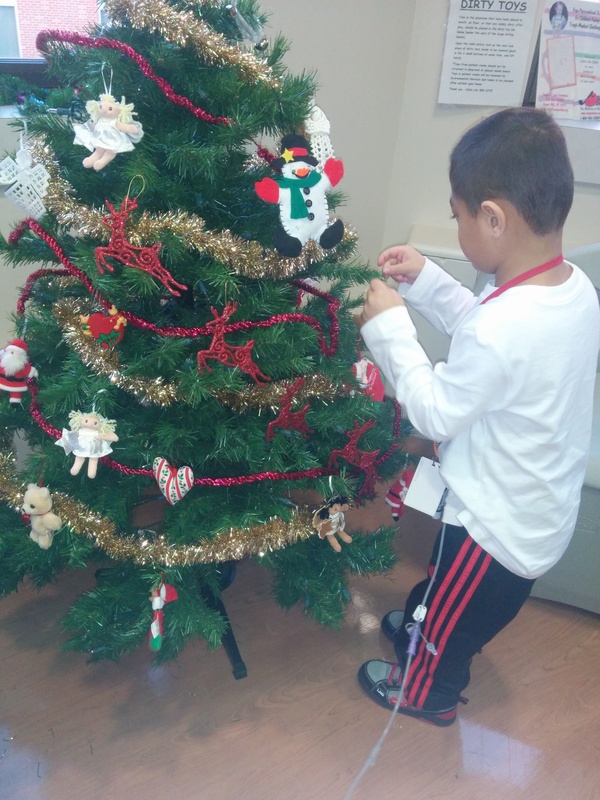 Patrick had a great time exploring its ornaments. Because once he’s up, he’s up. He had a great day yesterday. He’s up and around the room now. Physical therapy came by and we checked the fit of his walking brace that we had repaired. It was a bit shocking to me to see just how ill-fitted it is now. His muscles have diminished so much over the past month of bed rest. But wearing it as needed shouldn’t do him harm. And the goal now is to build those muscles back up. So she got him up and we walked to the playroom and played with magnet letters for a while. Then when he was good and tired, we came back and took a nap. Overall, the day was chaos. 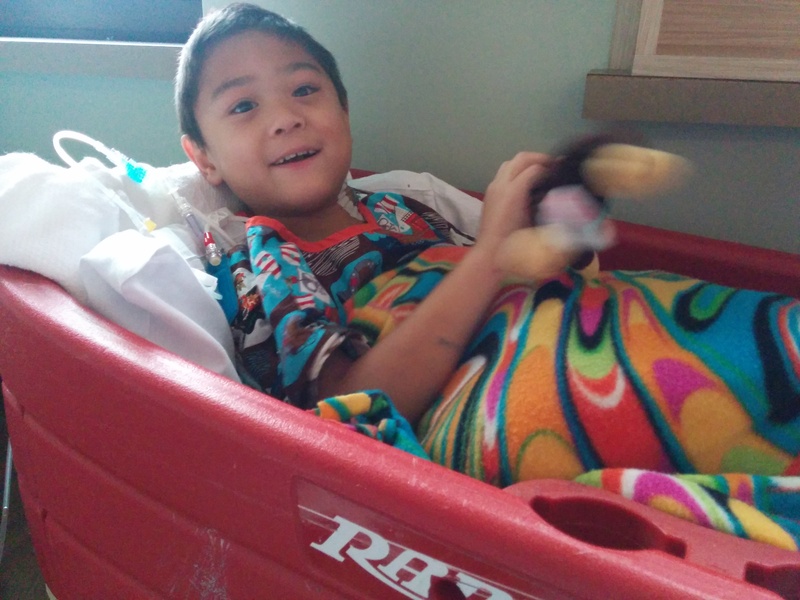 Patrick is doing well enough to meet the criteria to be discharged from the hospital. Unfortunately, the levels of prograf (anti-rejection medicine) in his system have been either too high or too low. Until those levels stabilize, he needs to stay inpatient. The lab results were late coming back so for the morning, we got ready for discharge just in case. And in the afternoon, even though the level came back too low, we were still getting visits to discuss discharge planning. (I wish I could say this was more exciting, but we have been having discharge planning conversations off and on for a couple of weeks now.) It meant, though, that we had people in and out of the room and a lot of chaos all afternoon. It also meant that I couldn’t leave the room to go do any shopping or laundry or other preparations for the weekend. I think this was the hardest part of an almost discharge. Being here alone means that I get very little time to get out of the room and to take care of those basic living needs for me. Once, maybe twice a day, a volunteer will come by for 1-2 hours. For the past several days, the team has had me spending those precious got-a-volunteer hours preparing for discharge. But that means that the other things haven’t gotten done and there aren’t other opportunities later to make up the difference. So, since evenings are when there are no volunteers and the nursing staff is busy starting a new shift, I gave Patrick a choice of ideas for dinner. We decided it would be good to take him for a walk. Now remember that he has been riding in a wagon anytime he goes outside of the unit. Yesterday’s walk was about 6 times farther than he’s used to going. He was extremely winded by the time we got to the cafeteria. But he was a great sport about it. He even kept his mask on and washed his hands with hand sanitizer and let me clorox wipe his chair before he sat down. We bought him some chips and me some sushi. In the end, he was too tired to eat, though. We came back to the room and I was sure he was going to crash. We did his advent ornament craft while waiting for the nurse, then decided she wasn’t coming before evening meds. We video called daddy, then got ready to sleep. But wouldn’t you know it, that’s when Patrick’s nurse came in. And I made the mistake of telling her that I hoped to make up for not getting away for laundry and/or shopping by going after Patrick went to sleep. I’m not sure entirely that it was that.. it could have been the stuffy nose that the dry hospital air is causing.. or that Patrick could sense my growing anxiety. But last night, Patrick decided not to sleep. I tried everything I could think of. Finally, about 11 I gave up on my plans and just tried going to bed. A little before midnight, Patrick went to sleep. I didn’t sleep great. I woke up several times trying to figure out how to get laundry done before we completely ran out of clean clothes and some things purchased that we’ll absolutely need by Monday. I’ll blog again later today and you’ll see I found a couple of temporary solutions today. But I’m going to have to find a better way to balance time and a better or different way to use helpers. Because this method isn’t working and it appears that sneaking off in the middle of the night to make up the difference like some other moms do is not going to be an option. 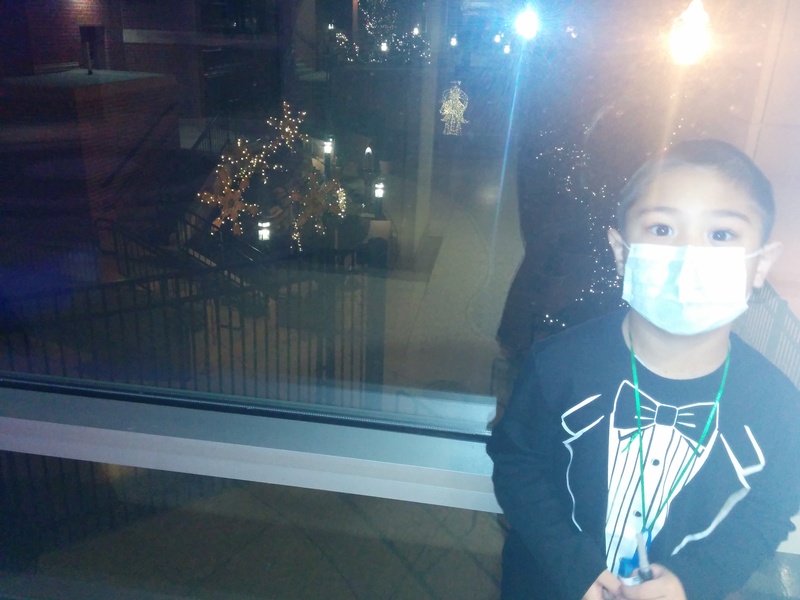 This entry was posted in Life as an SBS mom, Recovery, Transplant and tagged hospital stays, intestinal transplant, physical therapy, prograf, special needs parenting, transplant, University of Nebraska Medical Center on December 6, 2014 by geekino. Today was a relatively quiet day. In fact, by the end of it, I think we all were feeling more than a little stir crazy from being in the same room together doing the same things day in and day out. But quiet is good. Patrick definitely had a better day. Between the slight reduction in feeds and me finding a way to be super sneaky and unsmelly in emptying his ostomy bag, he didn’t spend the day feeling sick. That left him free to try other things. Like walking, for example. 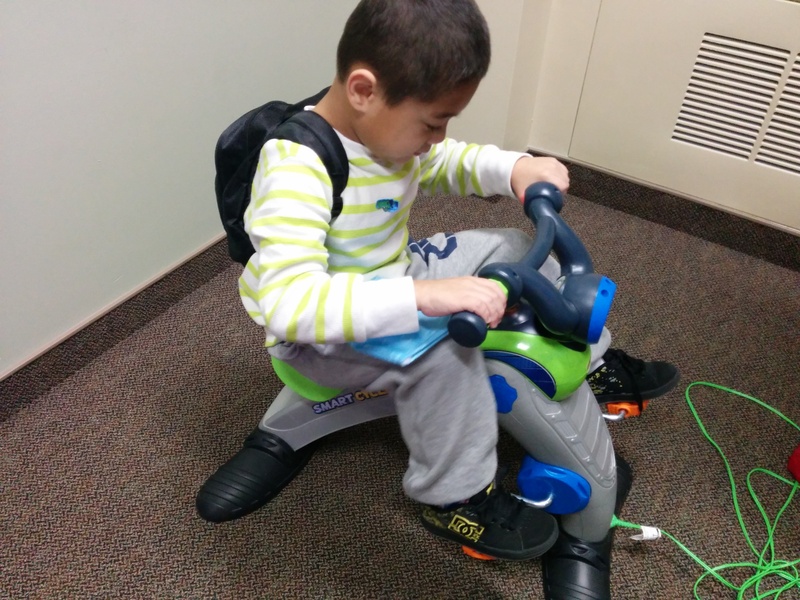 The physical therapist came by and encouraged us to let go of his hand and try walking. He was a touch unsteady and there certainly moments where he moved the wrong way and it hurt. But he did it. And it gave me the idea for a game that kept him motivated to walk several more times. Because Patrick loves Blues Clues, I drew some pawprints on slips of paper and I hid them in strategic places that he would have to bed or reach a little to get. Then we’d go play Blues Clues and find the pawprints. He actually was really upset when I wouldn’t play anymore tonight. 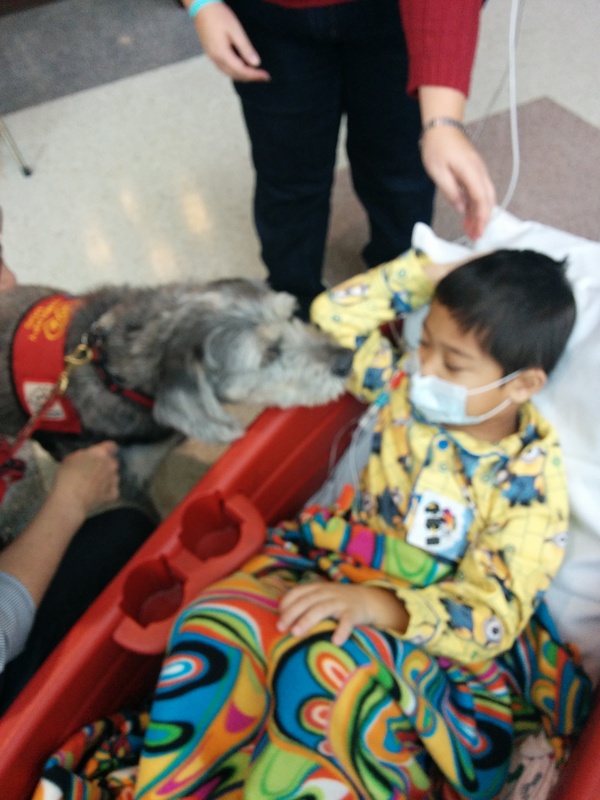 And speaking of pawprints, we decided to go check out pet therapy today. 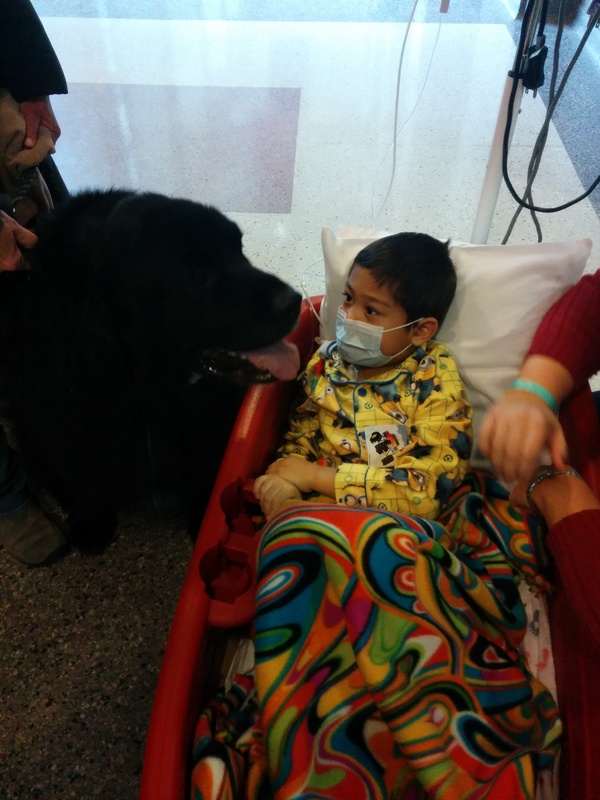 They have several specially trained dogs that visit the hospital. Very sweet and obedient. Patrick was more fearful of them than I expected.. perhaps because he’s still sore and was afraid they might jump on him. But it gave us someplace to go to today, at least. The other big news is that Patrick’s biopsy results came back. Amazingly, today’s rejection score was a 0. No rejection at this point. That leaves us with a few goals to work on. 1) Get Patrick’s feeds back up that 5 cc’s more to 95 without making him sick. 2) Switch him over from IV replacement fluid to replacing lost fluids through his g-tube. As long as he has an ostomy (which will be over a year), he’ll need a little bit of extra hydration. 3) Get a plan of how to pay for Patrick’s Valcyte. It turns out that they missed checking a box on the patient assistance application and are now having to reprocess it. I’m spending tonight at the Ronald McDonald House. It is strange to be here. It is strange to know they are there. I also have gotten quite used to going to bed with Patrick so staying up late to finish the laundry has me quite tired. And that is making me appreciate my husband because he has been doing this for us every few nights for the past several weeks. I also appreciate the flexibility of the people he works for and with. I have been trying to find a way to give him more time to catch up on work. And in the end, he just keeps setting aside what he’s doing to come in and save me.. to make sure Patrick is up and walking, to make sure I get a chance to eat and shower and change my clothes, to snuggle with Patrick so he can nap. Before long, we are going to have to let him go.. and I can tell you I am going to miss having him here. Patrick will too. Which is part of why, despite Patrick’s protests about my leaving, I am here and they are there tonight. At least, in my mind it is. This entry was posted in Life as an SBS mom, Medical updates, Ostomy, Recovery, Transplant and tagged hospital stays, intestinal transplant, physical therapy, transplant on November 21, 2014 by geekino. Patrick woke up happy and friendly this morning at 6 a.m. During the night, he’d managed to work himself into a position where his head was resting on my shoulder, which made him as happy as can be. (He has an IV in his neck right now that makes it impossible for us to comfortably have him rest his head on my arm.) So, we found his tooth fairy money and we layed in bed and snuggled and talked. Then, the morning excitement came. They don’t love sleep in the PICU. As soon as he was awake, they wanted to weigh him. I insisted they at least give him pain medicine first. But weighing is one of Patrick’s least favorite activities as it requires that he stand entirely on his own. Today, he managed to be weighed, but when I wouldn’t pick him up and carry him back to bed, he curled up on his knees on the floor and refused to move. It took some effort to come up with a way to coax him back to bed, but we eventually got here. Physical therapy stopped by earlier today and asked about taking him to walk. We crafted a couple of plans that we thought might help motivate him. One of them included me offering him a wagon. But still, when it was time to get up, Patrick didn’t want to have any of it. Eventually, we just took him anyway. Once he got to the wagon, he’d earned a ride around the unit which brightened his mood and, with the wagon’s removable side, I was able to coax him to walk from wagon to bed a couple of other times during the day. Getting him out of bed 4 times in a day is a record. Out for a wagon ride as a reward for a long walk this morning. There weren’t many medical changes today. 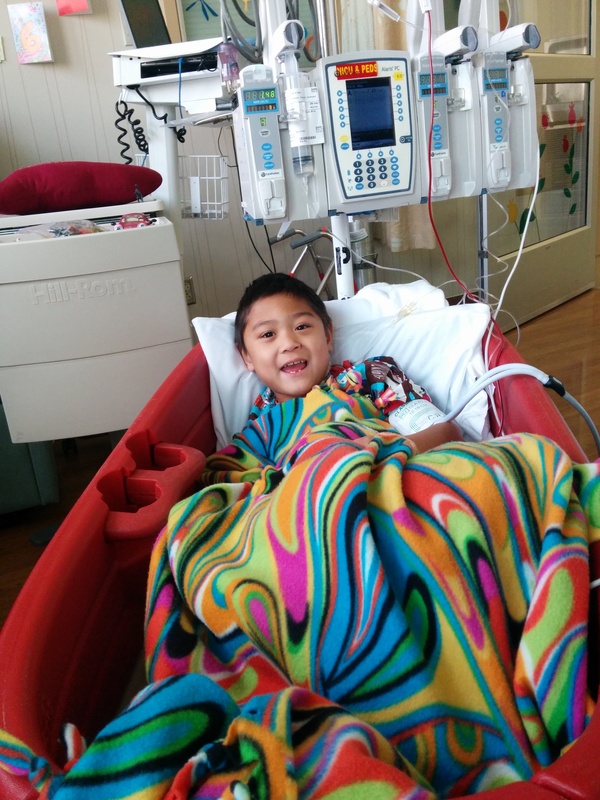 Patrick’s hemoglobin was low following yesterday’s biopsies, so they gave him a transfusion. I hadn’t realized how pale he was until I saw him with color again. That meant an awful lot of monitoring by his nurses, though, which meant very little time for sleep. Then, they made a big fuss about getting Patrick ready to go and out of bed into his wagon. So I moved him to his wagon.. and then we waited, and we waited, and we waited because the nurse on the floor was too busy. Finally, at 5, Brian texted to say that he had arrived back in Omaha and just a little while later, appeared in the room. Goodness, it was a relief to have him back. 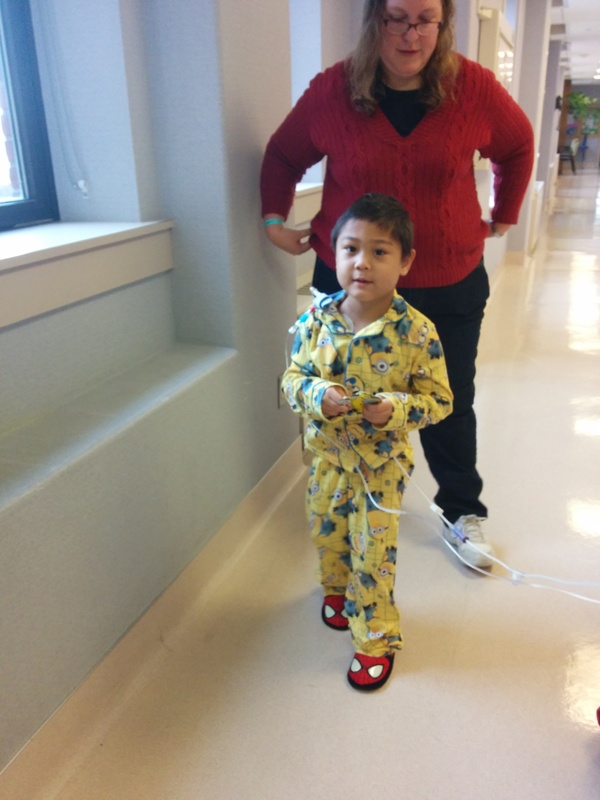 Not long afterwards, they finally came to move us out of the PICU and onto the Pediatric Floor. This is probably going to be our home for a while… But they gave us one of their bigger rooms which is going to be a whole lot more comfortable, assuming they leave us here instead of playing the hospital shuffle. I think this is one of the largest hospital rooms we’ve ever stayed in, complete with sleeper couches and a closet and a fridge. It’s strange to have so little going on after such a busy week. Nurses pop in and out from time to time, but mostly we’ve been left alone. I think we are all exhausted and looking forward to what will hopefully be a better night’s sleep. Now that Patrick has had his moving day, Brian and I will have ours. I understand there is a carload to get situated. Then we’ll see about settling into what we hope will be our home away from home routine for the next few weeks. For anyone still looking to send mail, our room number is now: 6229. Mail time is currently our favorite part of the day. Patrick picked this pose: sleeping in the wagon. 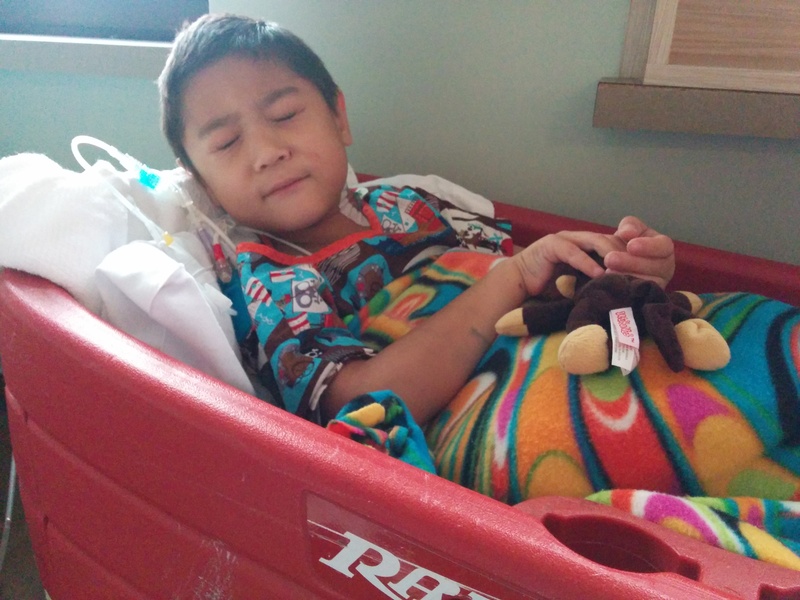 This entry was posted in Life as an SBS mom, Medical updates, Patrick, Transplant and tagged hospital stays, physical therapy, PICU, transplant on November 8, 2014 by geekino.